The use of fine wire circular external fixation has recently undergone a resurgence in popularity among orthopaedic trauma and reconstructive surgeons. Their modularity, biomechanical characteristics and minimally invasive application make these fixators indispensable for complex trauma and post-traumatic limb reconstruction. The application of these fixators is technically demanding and a steep learning curve exists. 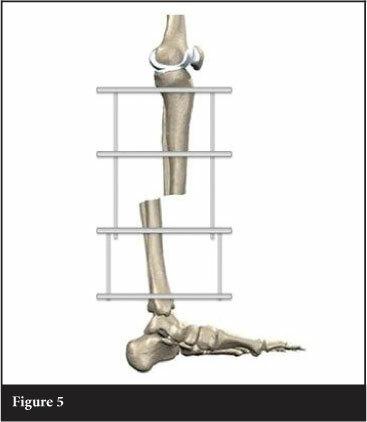 This article aims to provide a simplified, stepwise approach to the application of a circular external fixator to the tibia. Gavril Abramovich Ilizarov popularised the use of fine wire circular external fixators in Russia during the Cold War. Introduction to the West only came in 1981 after an Italian photojournalist, Carlo Mauri, was treated for a tibial non-union by Dr Ilizarov. In the following three decades we have seen a dramatic increase in the utilisation of fine wire external fixators, with a growing number of applications in elective and trauma orthopaedic surgery. The Ilizarov system, as well as the Ilizarov principles of distraction osteogenesis, has subsequently become indispensible for limb reconstruction surgery.1,2 Circular fixation has several advantages in the trauma setting, including the minimally invasive nature of application and the establishment of the optimal biomechanical milieu for fracture union. In this article we describe our surgical technique for applying a fine wire circular external fixator for a midshaft tibial fracture. 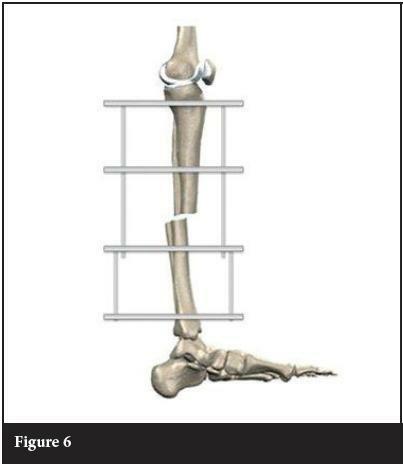 This overall stability will produce a degree of inter-fragmentary motion that is unique to each specific fracture-fixator configuration. Circular external fixators are fundamentally different from monolateral fixators.3,10,11 Through the use of tensioned fine wires as fixation elements, as opposed to half-pins, ring fixators are imparted with elastic properties and a low axial stiffness, while simultaneously preventing excessive bending and translational shear through high bending and translational rigidity.2,3,10 Tensioned fine wires also contribute to the circular external fixator's ability to exhibit increased axial stiffness with higher loads.12 This non-linear, load-dependent axial stiffness is similar to the viscoelastic properties of tendons and ligaments,2,12 and this biomechanical attribute has led to fine wire circular external fixators being described as the only form of 'true biological fixation'. This biomechanical superiority along with their modularity and minimally invasive application make circular external fixators ideal for the management of complex trauma and limb reconstruction surgery. Meticulous pre-operative surgical planning is essential with the use of circular external fixators. The modularity of ring fixator systems affords the user the ability to construct a specific external fixator configuration for each individual fracture pattern. This attribute is especially beneficial when dealing with complex fractures, but the process can be very time-consuming when done in theatre. 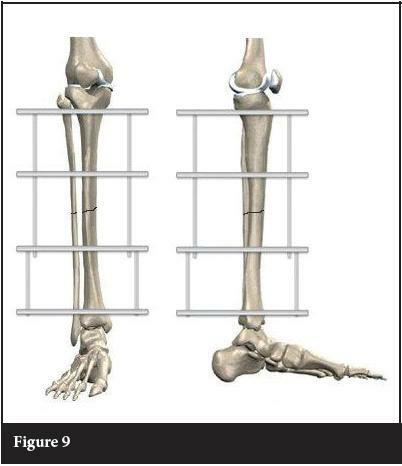 We therefore advise that, after studying the fracture pattern, a custom external fixator is prebuilt for each case and sterilised fully assembled (Figure 1). Essential to this technique is constructing a frame with two ring blocks, and the ability to adjust the distance between the ring blocks. When building our trauma frames we incorporate long threaded rods in one of the ring blocks (Figure 1). This allows intra-operative adjustment of the distance between the ring blocks, resulting in inter-fragmentary compression or distraction. 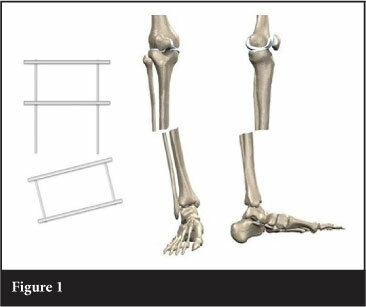 During frame application, the frame is set at moderate distraction to facilitate fracture reduction. The first few steps of the external fixator application are critical to fracture reduction. This involves application of the proximal and distal reference wires, which are inserted in close proximity to the joint capsules of the knee and ankle respectively. In order to avoid traversing the joint capsules, and eliminating the potential risk of septic arthritis, these wires should be placed outside the reflections of the joint capsules. For the knee and ankle joints, this is approximately 1.5 cm and 1.0 cm respectively. Accurate placement of the reference wires, parallel to the knee and ankle joint lines, will address coronal plane angulation. 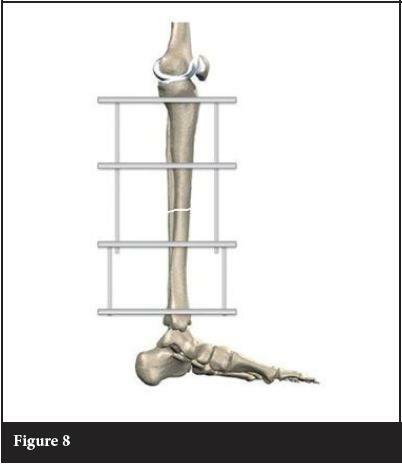 The proximal reference wire is inserted transverse (in the coronal plane), and parallel to the tibial plateau articular surface / perpendicular to the proximal fragment mechanical axis (Figure 2). The prebuilt frame is applied to the limb, fixed to the wire, and the wire is tensioned. The distal reference wire is then inserted in the coronal plane, and parallel to the distal tibia articular surface / perpendicular to the distal fragment mechanical axis (Figure 3). Attaching and tensioning the distal reference wire to the distal ring will align the proximal and distal fragments in the coronal plane (Figure 4). It is important to ensure proper rotational alignment before attaching the distal reference wire. Once coronal plane angulation is corrected, attention must be given to translation and angulation in the sagittal plane. This is addressed by the position in which the distal reference wire is attached to the frame. 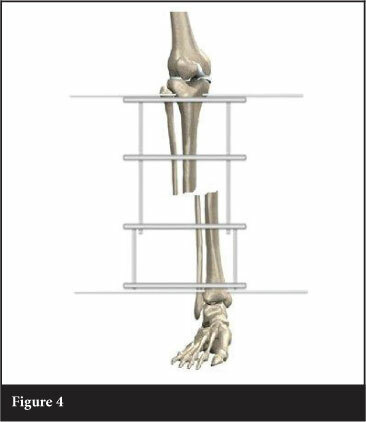 Due to gravity and patient positioning, the distal fragment will usually be translated posteriorly and angulated in recurvatum (Figure 5). Posterior translation of the distal fragment is corrected by attaching the distal reference wire in the anterior half of the ring and aligned with the knee in the coronal plane (Figure 6). Coronal translation and sagittal angulation are the final displacements to be addressed. Firstly, coronal translation is corrected by sliding the fracture fragments along the reference wires until aligned (Figure 7). Sagittal angulation (Figure 6) is corrected by rotating the fracture fragments around the reference wires until alignment is restored (Figure 8). Rolled up towels will maintain this reduction until it can be stabilised with fixation to the middle two rings. This final position is maintained by adding fixation to the two middle rings. Adding a second, tensioned wire to every ring on the frame completes the fixation. This wire can safely be placed parallel and deep to the anteromedial surface of the tibia (approximately 60° to the horizontal / transverse wire.) The final adjustment of the fixator is compression across the fracture site. This is accomplished by adjusting the distance between the proximal and distal ring blocks (Figure 9). is a meticulous insertion technique. The surgical technique described in this article is simple, reproducible and effective. Accurate reference wires serve as the foundation for a successful frame application. 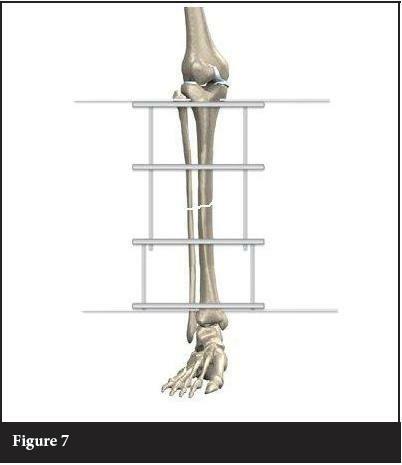 Fracture reduction proceeds in a stepwise fashion, starting with coronal plane angulation and translation, followed by sagittal plane translation and angulation. Finally compression allows for accurate apposition of the fracture fragments. When these steps are followed meticulously it allows the surgeon the ability to obtain anatomical reductions for midshaft tibial fractures.